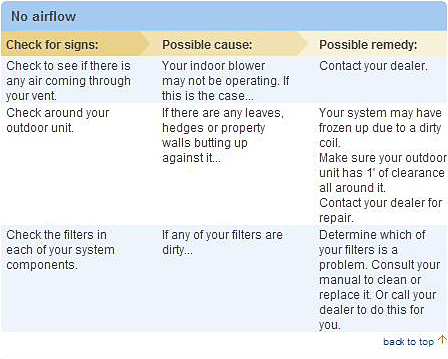 Read our HVAC troubleshooting recommendations: DIY Solutions & FAQ's. Turn the thermostat at least five degrees higher than the room temperature. If the furnace is sometimes blowing cool air, you want to check the thermostat fan setting to make sure that it’s set at “auto,” not “on.” The “on” setting will cause the blower to run constantly, even if the furnace is not heating the air. 1. Heat exchanger overheats and shuts down. 2. Soot can build up on the heat exchanger, lowering your furnace’s efficiency. 3. Reduces airflow coming out the vents. The furnace is running, but you’re never comfortable. 1. A standard wall switch near the furnace: it should look just like a light switch. 2. The circuit breaker panel: look for the switch with a furnace label next to it. If the switch is in the middle position, it’s tripped. Turn it to the “off” position and then “on.” If the circuit breaker trips again, you have another issue you need to fix. 3. The front door panel on the furnace: make sure the panel is shut all the way; there’s a switch under the panel that needs to be depressed for the furnace to work. Homeowners often close air vents in unused rooms to save money. However, closing vents in any rooms actually causes the opposite to happen: it wastes money—and it can cause the furnace to shut down, too! Less comfort: Most homes have air duct leaks, allowing your heated or air-conditioned air to escape. Extra air pressure in the ducts pushes more air out through the leaks, or even worse, creates more air leaks. That means there’s less air getting to certain parts of your home. Furnace keeps shutting down: Air is not able to be moved as efficiently, including the hot air. The air gets backed up in the system, causing the furnace to overheat and shut down. If you're having heating and air issues, the first thing you should check is your thermostat. A lot of people don't realize that a simple error in their thermostat's performance can throw their entire heating and cooling process off. 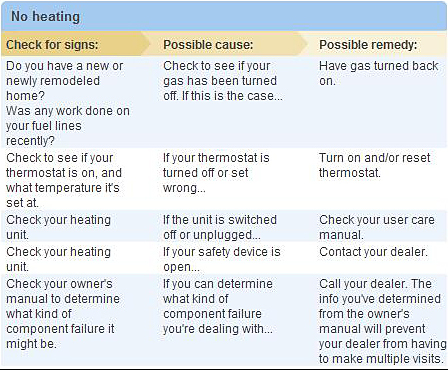 Always check your thermostat before calling someone out to perform costly repairs. If the touchscreen is blank, check your batteries! You'd be surprised how many people let the batteries run out and then wonder why their thermostat isn't running properly. Check the manual that came with your thermostat to find out what type of batteries you'll need and how you need to go about changing them. Check your settings. Is your thermostat set to perform the proper function? 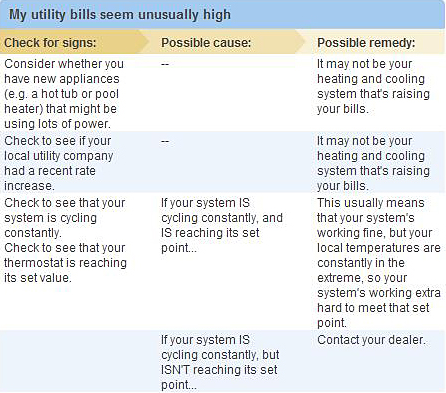 There are many things that can go wrong with your thermostat. Depending on the type of thermostat you have, you'll have more steps to run through when troubleshooting. It's always a good idea to refer back to your owner's manual. If you've misplaced it, you can always find a copy online. If you've tried everything you can think of, call us! We'll come take a look at your thermostat and your heating and air system and get the problem solved for you! Q: How does an air conditioning system actually work to cool the air in my home? An air conditioning system consists of two parts: an outdoor unit (where liquid refrigerant is contained) and an indoor coil. As the air moves across the air-conditioning coil, the refrigerant removes the heat from the air as well as the moisture by condensing it on the cold surface of the coil. In this way, an air conditioner not only cools but also dehumidifies the air. Virtually any system can have air-conditioning hooked up to it, provided that it is a forced-air system. In cases where there is not forced-air heating or a duct system, we can use “ductless” air-conditioning systems to cool an entire home or small business. Q: What is a S.E.E.R. (Seasonal Energy Efficiency Ratio) rating and what does it mean to you? S.E.E.R. stands for Seasonal Energy Efficiency Ratio, the standard measurement of air-conditioning efficiency established by the U.S. Department of Energy. What does this mean to you? Higher S.E.E.R. ratings translate into greater efficiency, which means lower heating and/or cooling bills. The most important thing to remember is that the higher the S.E.E.R. rating, the more money you save. Q: How can I get even amounts of heat/cooling to certain parts of my house? Adjust the louvers inside the registers on the wall or floor in the room where too much heat/cooling is present so that the registers are partially closed. For example, to get more cooling upstairs during hot summer months, partially close the registers downstairs to force more airflow to the upstairs registers. Consider using a programmable thermostat to automatically increase or decrease temperatures during the day and night to suit a family’s lifestyle and reduce energy cost. ⬇ Have your air-conditioning system tuned-up for the season for peak efficiency. Operating at peak efficiency will save money, because the system doesn’t have to work as hard to do it’s job. ⬇ Replace your furnace or air-handler filters on a regular basis. Lack of regular filter changes and maintenance is the number one cause of system breakdowns and costly repair bills. ⬇ Keep the thermostat constant. Continuously adjusting the thermostat can be very inefficient. Keep the home at a constant temperature during the day. For example, leaving the home at a constant 68 degrees during the day, then dropping it at night to a comfortable sleeping temperature, will reduce energy consumption. Your furnace will run less with a constant temperature vs. a lower temperature in the middle of the day and at night. ⬇Flip the fan switch on your thermostat into the “fan on” mode when cooling the house. This process will ensure that air is always being stirred to prevent hot and cold pockets from forming. ⬇ Install awnings or plant trees that will shade southern facing windows. This keeps the hottest rays of the sun from shining directly into the house. ⬇ Replace older windows with more efficient low-E glass. These windows help to reduce the effect of the suns warming rays. Also, keep storm windows closed. These tips will reduce the heat load gain on your home, which means your heating and cooling system doesn’t have to work as hard to keep the home at a comfortable temperature. This saves money and extends the life of the system. ⬇ Install an attic fan to help ventilate some of the hot air out of the attic. Attics can reach temperatures of 140 – 150 degrees, and this build-up of warm air can make the upstairs of a home warmer than it needs to be. This makes the air conditioner work harder to do it’s job. It costs you more to cool your home and the life of the system can be decreased. ⬇ Run a dehumidifier in the basement if the basement is humid. A damp basement can add moisture to the whole house. With the humidity levels as high as they are around here on their own, you don’t need that! A dehumidifier in the basement will help to reduce the humidity levels in the home, making it more comfortable throughout during the hot summer months. ⬇ Clear or cut back shrubs and bushes from the outdoor unit. The sides of the unit require at least 12-18 inches of clearance for proper performance. ⬇ Use appliances in the evening.